PENTAX-developed Aero Bright Coating II — a lens-coating nanotechnology employing a super-low refractive film fabrication process. 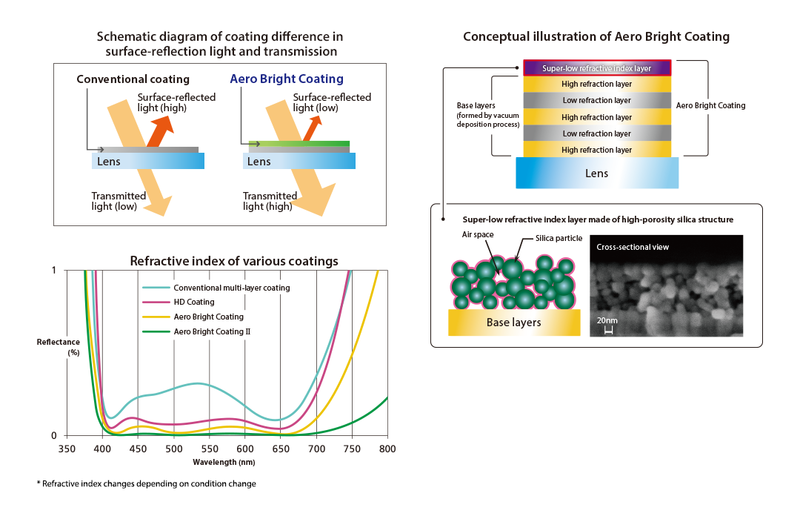 Aero Bright Coating is a new layer formation process based on nanotechnology. It applies a silica aerogel coating layer with a uniform porous structure over a regular multi-layer coating. By trapping low-refraction air between stablesilica nanoparticles, it forms a super-low refraction, high-transparency coating. It also drastically reduces surface reflections, while minimizing flare andghost images. With Aero Bright Coating II, by increasing the amount of air trapped in the silica aerogel layer, this process successfully form a super-low reflaction coating superior to that of the original Aero Bright Coating. By considering the lens characteristics, selected coating is adopted to achieve optimum performance. By coupling this advanced lens coating with the high-grade, multi-layer HD Coating, which reduces average reflectance in the visible ray spectrum to less than 50% of conventional multi-layer coatings, the lens effectively reduces flare and ghost images to a minimum, even in demanding lighting conditions such as backlighting. PS. HD PENTAX-D FA★ 50mm F1.4 SDM AW is the first model of the “New generation of Star-series lenses”. Aero Bright Coating II firstly used on HD PENTAX-D FA★ 70-200mm F2.8 ED DC AW; and Aero Bright Coating (not II) was used on smc PENTAX-DA ★ 55mm F1.4 SDM (in K-mount lens line). Posted in D FA Lenses, D FA Prime Lenses, HD PENTAX-D FA★ 50mm F1.4 SDM AW, K-mount Lenses.